I love projects and Pinterest so when Sherry over at Young House Love posed the 2nd Pinterest Challenge I had the perfect pins in mind. Dylan got me these great fish bowl bookends two birthdays ago and we've had little success keeping any kind of fish alive in them. (R.I.P Goldfish 1, Goldfish 2, Goldfish 3, Goldfish 4, Betta 1 and Betta 2 - you were doomed from the start without names.) 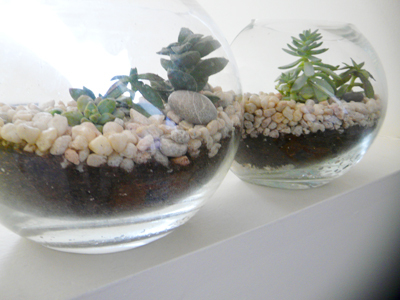 One day it suddenly dawned on me that they could be terrariums! They don't have lids, so mossy dioramas were out of the question, but after a little searching I found that succulents would be perfect. 2015 UPDATE: Terrariums 2.0 has arrived! Click here to see how the terrariums have survived a few moves and got a little freshening up this year. 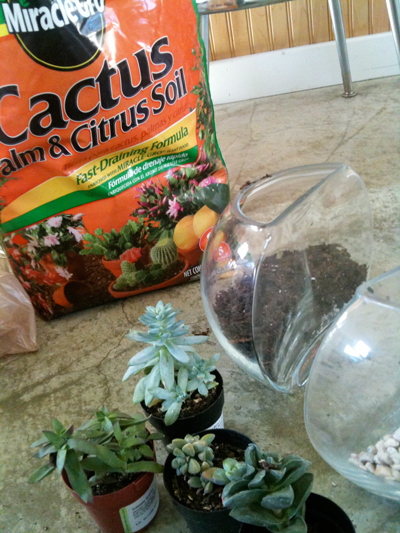 Supplies - Glass fish bowl bookends, tiny succulents, Cactus/Succulent potting soil, decorative stones, and a spoon. I think my favorite part about this project was realizing that this was the perfect place to display the stones we have brought back from Iceland, Lake Superior and Italy. 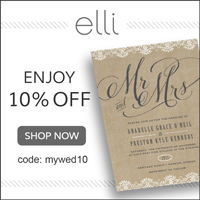 You're so clever -- these are perfect!!! ha! I have been wanting to do this for a WHILE. I wanted to make it a weekend project I did with friends visiting so they had a take home gift! I love them!!! It looks amazing! I need to start looking for containers... thanks for the inspiration! wouldn't you know i happen to have the same luck with fish, and the same fishbowl bookends. i wonder if it's the bowls?! anyway, i will be converting them to succulent terrariums like yours! mla - Too strange! I was so thrilled when this idea dawned on me I was in a real funk about killing so many fish. My daughter (12) and I made some last night. They were fun and easy to make and turned out quite nice. Thank you for the idea and great pictures! Berry Blogger - Please post pictures! I would love to see how they turned out. Thanks for reading! How often do you water them? Kim, I've had the best luck neglecting succulents but with these I've been watering them about every couple of weeks. I would refer to the care instructions that come with the individual plants for best advice . Perfect for my countertop in Arizona. This is just a random fact for ya :) I worked at PetSmart a few years back in the "animal care" and we sold the fish, you know from the giant wall of tanks? Your goldfish died so quickly because they need a filter and a large tank. Many people do not know this, including me before I worked at a pet store. They give off so much ammonia that it suffocates. I had to refuse to sell the goldfish to people who were not keeping it in a 10 gallon tank with a filter. Put the money into them and they can get pretty big and live for a really long time. The bettas....maybe reading too often? They only need to be fed a few pellets i think every 3 days. Just in case you want fish! 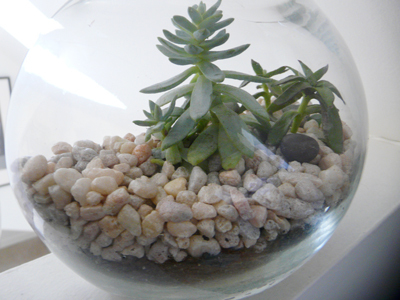 :) I love the terrariums....DEFINITELY doing this!! Thank you! I have a question: I thought the water needed to drain out of the container. Won't the succulents rot if the water does not drain? I think this happened to my jade plant so I had to get a new one and I put it in a terracotta pot with a hole to drain the water. I LOVE this idea, but I do NOT want Jade and Spike (my plants' names) to die! I'm a small stone collector too, and what a great idea! and even better, I love succulents. I'm definately going to do this. I love terrariums and succulents and here they are together! Great idea. My favorite picture are the cylinders with the different layers under the succulents. Obviously there is dirt and rocks, but what are the other layers. Is the black stuff charcoal? so sorry but these bowls should not be sold to house fish...the fish are highly unlikely to survive in such a cramped and easily polluted environment. Its not your fault, you didn't know and well done for finding an alternative that is creative, beautiful and humane. I'm asking the same question. Don't plants need drainage such as clay post? Or is the point NOT to over water? I'm asking the same question. Don't plants need drainage such as clay pots? Or is the point NOT to over water? Here's my response to all the comments regarding drainage. From the research I did before creating my terrariums putting in an inch or so of large pea gravel in the bottom of the container acts as a drainage layer. Most instructions also say to lay a 1/2 inch of ground charcoal on top of this... I couldn't find this at my Home Depot so I'm experimenting with doing without. My overall advice on the terrariums is to water sparingly. You'll be shocked how little water succulents really need to thrive. I actually left a little one without a pot, roots exposed, for several months before throwing it in soil and watering it and it bounced right back. Let me know if you have any more questions! I'll do my best to answer. Thanks for reading! Can I just say how happy it made me to see you have mixed rocks from Lake Superior with ones from Italy?? AWESOME. Thank you! Thanks Alyssa, need to plan the next trip to fill a few more terrariums! Just a little note on the charcoal...if you cant find it loose, then buy a box of filters for a fish tank pump. open them up and you should have enough in one filter for one bowl. three filters to a box. just make sure to rinse the filter before you open it up so you can wash away all the dust. Beautiful job on the terrariums. Very clever. I'll keep an eye out and let you know if I find the exact ones! Thanks for reading! 1, how often do I water? 2, what do you use to clean the inside of the bowl when it gets dusty? I water mine every couple of weeks, usually when the soil looks try or I can't see any moisture in the layers. As for dusting, I either use a paper towel that I have dampened with water or a bit of Windex and reach in to wipe the glass. I feel like watering it gets rid of the dust on the rocks for now, but in the future something like an old make up brush or swifter might lift excess debris out. Very interesting Project!!!!!! Love the idea, here in India I wouldnt get the special soil you have written about,guess could try vermicompost a little soil and sand mix????? I got my bowl at Goodwill, but I've seen them at the Dollar store - those are a BARGAIN. Having trouble finding pretty gravel! They sell them at Lowe's and for the small ones like what is shown in this blog they were no more then 3.50ish her plant some were only a dollar!! How much light do these succulents need? This is great, thanks for posting! I just found a really unique glass jar and I'm going to make one this weekend, I'll have to post it on my blog when I'm done! this is great. I've had a bowl that I don't know what do with (dont want more fishies). Doing this this weekend. Thanks for the idea. Check out Michaels. They have a great selection of glassware suitable for terrariums! The only thing I am worried about is.. do I bury root under soil that you have and then again cover with pebbles? I have some rath odd shaped plastic jars that I've saved for who knows what. I've had good luck with glass bowls. Do you think the plastic would work also? It has been many years since I attempted a terrarium...thanks for inspiring us to look at these great options! Do you think this would work with small sea shells instead of rocks? I have jars upon jars of them and need something to do with them. Wow! I made a terrarium for my classroom. It turned out wonderfully! Thanks for sharing this information. I can't wait to make other designs. Wow! I made a terrarium for my classroom. It turned out wonderfully. I can't wait to try other designs. Thanks for sharing this information. I've been researching this ever since I read your blog. I love the idea, I'm a plant killer :( Succulents and the idea of keeping something alive is really exciting! I read they need 5-6 hours a day of sunlight and to water every 2 weeks. I'm starting on my this weekend! 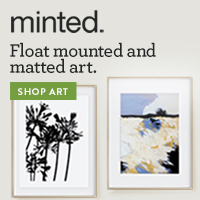 Found you through Pinterist and I love this idea! I'm definitely going to try it. I love terrariums! Thanks for the DIY! You can buy the charcoal in a pet store near the aquarium supplies. It is used to help keep the water filtered in an aquarium. Same thing in the terrarium. I also used aquarium rock at the very bottom, charcoal, a layer of window screen and then the dirt. Excess water drains into the rock and charcoal. The screen holds the soil from being washed into the rock. I have had one for over a year and it has been great. My terrarium doesn't have racks in the soil and itsby my window will it die? I made this last weekend and it came out great, I found the containers pictured in the first photo at the dollar store!! Time for a Dollar Store adventure! Thanks for reading! I just happen to have several large glass jars from spent candles. I have sea shells...could I use those for the terrarium? Yes, sea shells would be perfect!! I use a spray bottle to water mine. about 6-8 sprays once a week! Love the entire idea of this! We stopped having fish and I kept the tanks for making terrariums. Alas, never did the terrariums and when we moved from the east coast to the west coast I had to abandon the perfectly good tanks. I filled a 10-yard dumpster with all that I could not take . . . So, be on the lookout for abandoned fish tanks. Thanks for sharing this information. I can't wait to make other designs.